Rue Mapp grew up spending her summers playing outside on her family’s ranch in Lake County. But as an adult, she kept finding herself the only African-American on organized hikes. Tired of being “the only one," she started Outdoor Afro and found out she wasn’t. “I realized that when you identify all the only ones, and people did identify themselves as such, we were actually quite numerous,” she says. Now there are Outdoor Afro chapters across the country. Volunteers like Zoe Polk lead hikes, camping trips and bird walks to help African-Americans reconnect with the outdoors and with each other. The group uses social media, too -- to post resources, tips and photos of black people enjoying the outdoors. 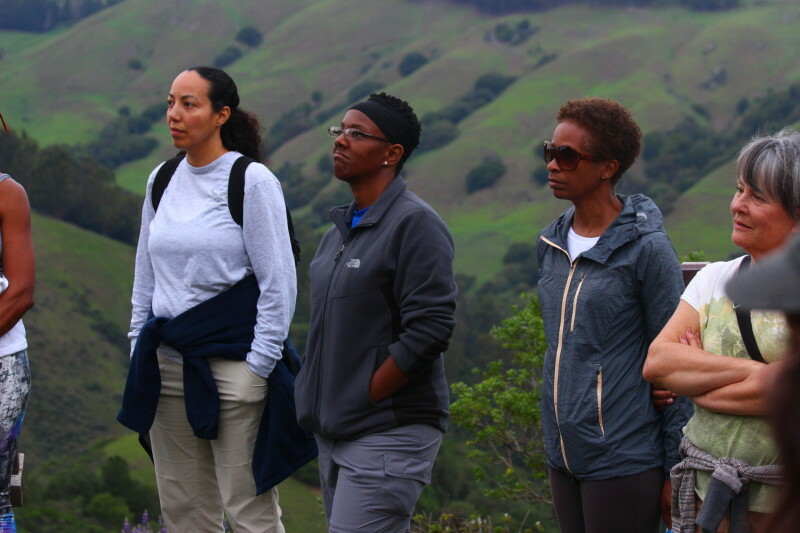 On a recent Friday evening, 30 people, most of them African- American, headed to the Oakland Hills for a hike. Trip leader Zoe Polk tells them what to expect. The group starts uphill through the woods, chatting and laughing along the way. The trail soon opens up into rolling grassy hills. There’s Mount Diablo to the east and the sun setting over the Golden Gate Bridge to the west. Polk stops the group by a lupine bush, its purple flowers in bloom. She asks if anyone has read Alice Walker’s "The Color Purple." “Is there a famous line in that book that talks about nature?” she asks. “It’s like the color purple,” shouts one participant, paraphrasing the famous quote. “You just don’t walk past it and not notice it!” Everyone cheers in approval. On this hike, Outdoor Afro is partnering with GirlTrek, a black women’s walking group, to honor Tubman, the leader of the Underground Railroad. Polk adds a few words of her own that we don’t normally associate with Tubman: hiker, botanist, astronomer. She reminds everyone that Tubman collected wild plants to treat the underground passengers' illnesses and she used the stars to navigate her way to freedom. “I actually love it when I remember to think of Harriet Tubman when I’m looking up in the sky,” Polk says. Outdoor Afro has always turned to nature as a tool to connect African-Americans with history and community. So when the nation was shaken by the violent events in Ferguson and Staten Island, Rue Mapp again turned to nature. “It was this moment where I wanted to do something, and I knew that going to the streets was not something that felt right for me,” Mapp says. So she organized healing hikes here in the Bay Area and called on Outdoor Afro groups across the country to do the same. The hikes have given people a chance to come together, talk and grieve. “I wanted to get away from people with other agendas and just create a platform where people could share and be heard,” says Mapp. Polk leads the group back to the parking lot just as it's getting dark. People say their goodbyes and drive off, taking a little bit of this peace and beauty with them.